What Was For Dinner Tonight!! We had bought these mutant chicken breasts from T&T awhile back, and this week I decided to make Cheddar BBQ Chicken in the oven. It’s a really simple recipe to prepare and bake. To accompany it, I made smashed potatoes with Boursin Herb and Garlic cheese in it. If you haven’t tried it yet, you MUST. It’s too nummy not too!! You can also serve it with whatever veggie you feel like as well. 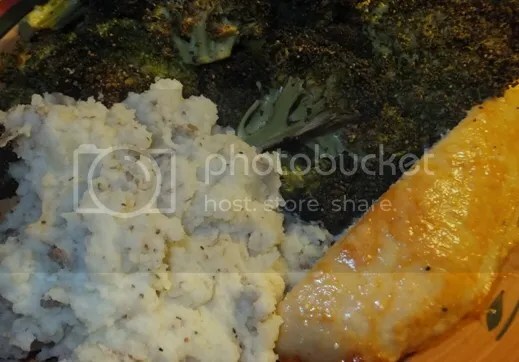 I love roasted broccoli, because it’s easy and tastes fantastic!! Now, I know the chicken doesn’t really look like there’s any cheese on it, but trust me I did add the shredded cheese LOL It’s most likely because I only used 3tbsp of BBQ sauce per breast (which my hubby and I halved to share…they’re THAT big). But trust me, it tasted great!! ← More Hello Kitty Donuts…omnomnom! !